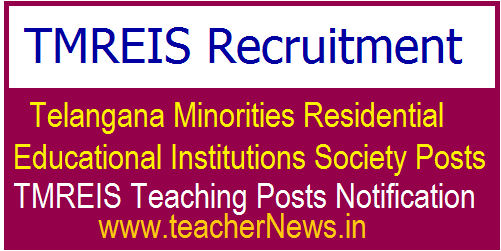 TMREIS 1863 Post Recruitment Vacancies in Telangana Minority REIS 2018 : TREIRB 1863 Posts in TMREIS through Direct Recruitment 2018. Telangana Finance Dept Approved TMREIS 1863 Posts, Telangana Residential Recruitment Board to fill the JL, PGT, TGT, PD Posts in TMREIS Institutions through Direct Recruitment. Telangana Finance Dept Approved TMREIS 1863 Posts.TREIRB JLs Recruitment, TREIRB PGTs Recruitment, TREIRB TGTs Recruitment, TREIRB PDs Recruitment notifications to be released for fill up the below mentioned posts in TMREIS Residential Institutions through Direct Recruitment. Telangana Finance Dept Approved TMREIS 1863 Posts. Finance department released G.O. MS NO 57 on Friday (May 18) to fill PGT, TGT, JL, PD and Librarian posts in Telangana Minorities Residential Educational Institutions Society (TMREIS) vacancies through Direct Recruitment. Public Services Recruitment Minorities Welfare Department Filling up of eighteen hundred and sixty three (1863) vacant posts in Telangana Minorities Residential Educational Institutions Society (TMREIS) through Direct Recruitment Permission to the Telangana Residential Educational Institutions Recruitment Board (TREI-RB) Orders Issued. In the reference, Second read above, the Minorities Welfare Department, have proposed to fill up certain teaching posts for Telangana Minorities Residential Educational Institutions Society (TMREIS) through Telangana Residential Educational Institutions Recruitment Board (TREI-RB). The Executive Officer, Telangana Residential Educational Institutions Recruitment Board (TREI-RB) is requested to take necessary steps for filling up of the above vacancies through direct Recruitment by obtaining the details, such as local cadres of the vacancies as per the Presidential Order (zone / district etc.. as applicable), roster points. qualifications, etc.. from the concerned authorities and for issue of schedule for recruitment and notification by the Commission accordingly. The Minority welfare department and and Telangana Minority Residential Educational Institutions Society (TMREIS) shall furnish details of all vacant posts authorized in this order, including the local cadre wise/subject wise vacancy position, roster points and qualifications, etc., to the recruiting agency immediately under intimation to Finance Department. The Department shall issue necessary amendments to their service rules / Bye-laws /Government Orders changing the existing recruitment procedure/recruiting agency, wherever necessary. Telangana Residential Educational Institutions Recruitment Board (TREI-RB) is requested to take necessary steps for filling up of the above vacancies through direct Recruitment by obtaining the details, such as local cadres of the vacancies as per the Presidential Order (zone / district etc.. as applicable), roster points. qualifications, etc.. from the concerned authorities and for issue of schedule for recruitment and notification by the Commission accordingly. TMREIS 1863 Post fill PGT, TGT, JL, PD and Librarian posts recruitment in Telangana Minorities Residential Educational Institutions Society.